Anyway, Who'll be doing this? 3 days left, CR hasn't said a single word and no fansubs announced anything. Preorders for the BD has already started, and the BD Jacket is also out. MV for the OP is also out on youtube. This is a disaster. T-Thanks, TBS. I wish you guys luck dealing with the angry Japanese internet otas. What I don't understand was that the official website originally said the delay would only be 24 hours at most. Making it Monday is... something must have gone wrong. There must be a screw up. Maybe they just don't have a time slot available. This would be it, yeah. They already booked it, but apparently Gundam G-Reco stole that timeslot instead because it got delayed too. Hence what was a 24hours delay became a 82 hour delay. Well, gundam is quite a brand name, so it can't be helped. That G-Reco looks like crap though, I love gundam series .. but that one .. ugh ..
C'mon, don't be such a pessimist. After all, it's Tomino-san doing G-Reco so expect good things from the Gundam creator. Just be patient! 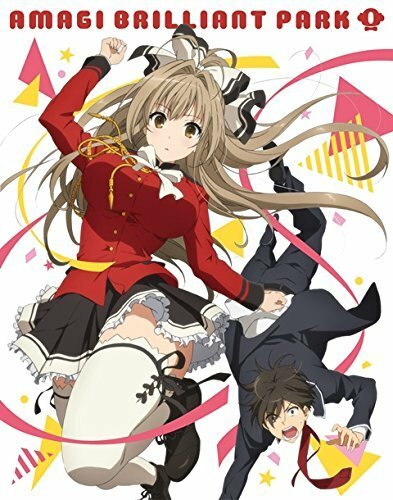 Anyways, guess that next Thursday (or Friday) will air Amagi Brilliant Park. Excuse me, but I have a feeling that episode one will air today. If it's true, then episode 2 will come this Thursday and we have an unusual deal that AmaBuri will air 2 episodes this week in different days for each!